See how Turkcell uses Datacap to help increase customer retention and become a more customer-centric organization. See how IBM and enChoice connect business operations teams to the data they need to keep operations running smoothly. Learn about the benefits of mobile document capture. Discover how Banco Galicia digitizes content to improve customer service and accelerate productivity. See how HSBC uses cognitive capture to boost accuracy, while freeing up staff for more value-added activities. Learn how each provider measures up and helps IT professionals make the right choice with their business content. Read how Central Nacional Unimed made the move to electronic content and streamlined workflows. Discover how streamlined data capture can help teams manage complex operations more effectively. Read how Conqord Oil introduced a new digital platform for managing safety card information with IBM ECM solutions. Explore how Ferservizi removes paper-based processes, introduces automation and empowers staff to work more effectively. Learn how Enerjisa transformed the way teams work with data by deploying a content management platform. Read how organizations are realizing the potential of the ability to scan documents and eliminate the cost of moving paper. Learn how organizations gain the power of cognitive computing to solve the toughest document capture challenges. Discover how mobile capabilities enable users to capture information with mobile devices. Learn how to apply more sensing, reasoning and learning to extend capture to new types of complex documents. Explore how machine learning and natural language understanding allow organizations to capture valuable data. Read how to speed bank loan processing, healthcare collaboration and tax document processes with cognitive content solutions. Do you stand apart from others? See how IBM case and capture solutions enable you to capture content and accelerate time to value with a cloud approach. Learn how cognitive and cloud-based ECM can help you protect your content while gaining a competitive advantage as you grow. Learn how issues and solutions are addressed around managing content as employees rely on content every day. 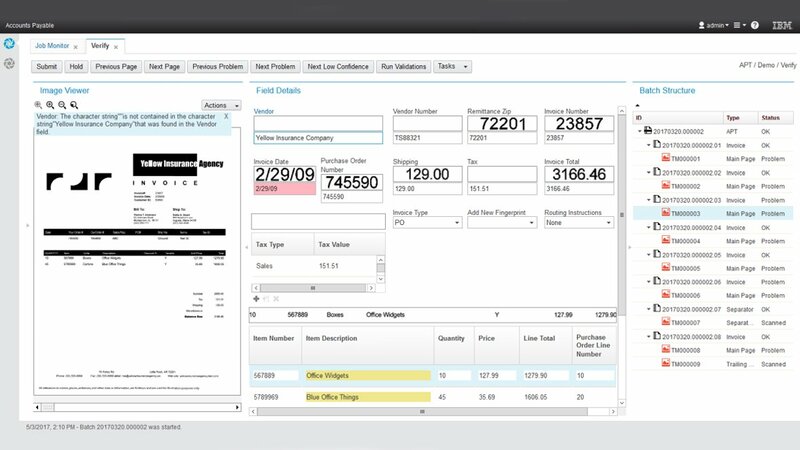 See how to lower costs, reduce errors and free employees from back-office tasks with robotic process automation and ECM.